Activities for toddlers can be tricky. They’re a hard age because they often want to put everything they can get their hands onto into their mouths or they want to dump everything they touch on the floor. Sensory bins a great way to encourage learning and will keep your little ones engaged while developing new skills. We love sensory boxes and now that the season are quickly changing we felt like it as time to add new items for my little friends to play with. For our fall sensory box : acorns & pinecones, plastic leaves & plastic apples. These Fall activities also caught my eye and perfect way to extend the play & continue the learning! This sounds like a great box. I love the idea. The fall bean box is a HUGE hit! This is such a neat idea. I love that it’s seasonal! The beans will be replaced with either rice (think snow) or cotton balls to replicate the snow. I have been scouring the dollar stores for penguins, polar bears and other arctic creatures as well. Only a few more weeks till the snow flies…. I must admit there is something soothing with letting the beans fall thru your fingers. Yup, never too old to play! Very cute idea, but how do you keep the beans in there? My kids would get them everywhere! We lose a few beans during play, we either pick them up or vacuum them up. If you use the lid you can just pour the escaped beans back in. I’ve never heard of sensory boxes until recently, but this is such a great idea. What a fantastic idea! I’ve never looked at the box in that way and think it’s a great way to held lids learn about texture and a wide range of topics. Love the sensory box name too. What a great idea! I haven’t thought on making a fall sensory box, but as my daughter loves sensory boxes, I think I might have to make her one. This is an idea I never heard of before. I would have really liked something like this for my children when they were young. Beans are so perfect for sensory activities. This one looks nice too, and I’m sure it’s very effective. I think this is so great. I like the fall additions you’ve added to it as well. Kids learn so much this way! This is a great activity. Such a fun activity. This is such a great idea. I would have definitely made this when my kids were little. I want to make one for my lil’ lady bean. What a great idea! So so cute! Great sensory box filled with good items and inexpensive to make. Thanks for sharing your fantastic idea. What a perfect set up for fall, I know you can have fun with halloween too. My kids love sensory bins too, I make them all the time with different themes. I use beans too. They are great filler and good for sorting, pouring, etc. This looks like a fun activity for toddlers! My little girl would love to play with this! 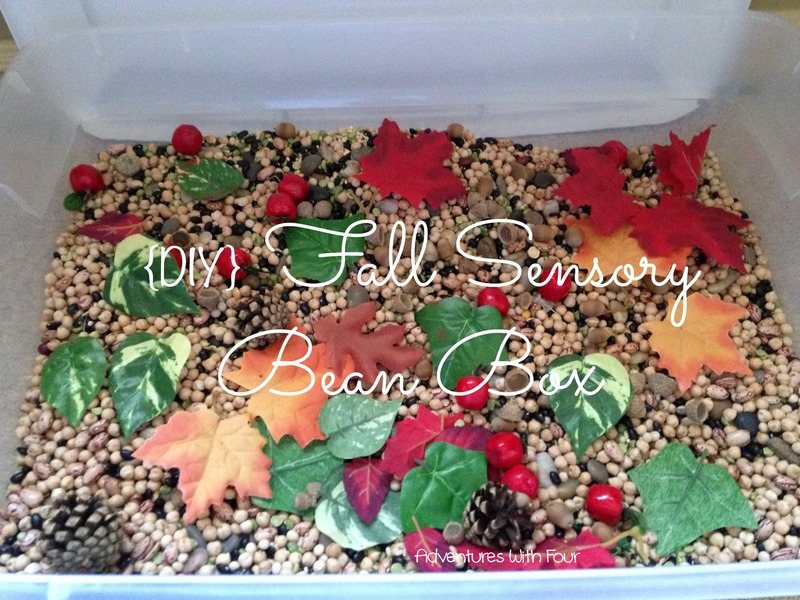 My preschooler would probably love this fall sensory box. I would probably provider who with a shovel or some cups to scoop with. I just didn’t add them in the photo! This is such an amazing idea for the kiddos… I have always bypassed sensory bins due to the fact that I didn’t have all the supplies. This is so simple to do! My little man had sensory issues when he was younger. This is a great idea.